A certificate of completion will be issued for each of the software packages covered. NB: If you sign up and pre-pay for both the introductory course and the advanced course (held between 20th - 24th April 2015) you will receive a discount. Please contact nick@solutioncentre.co.zw or (04) 442864 to find out more about this offer. Adobe Illustrator CS6 | CC - Covers the design features of this vector package. Practical exercises take the learner through tools and panels in the application and how to use them to create original designs. 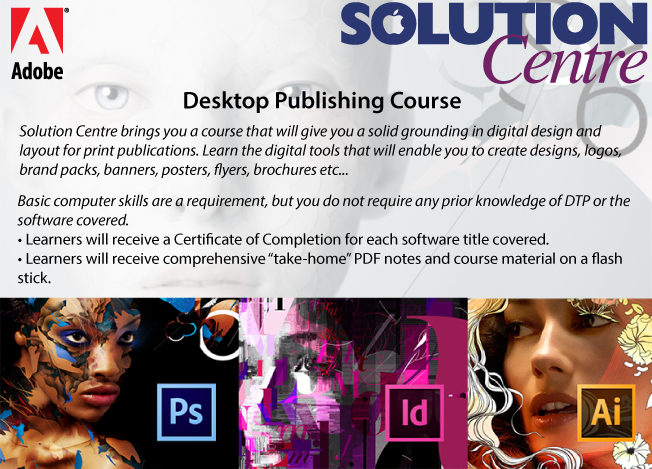 Adobe Photoshop CS6 | CC - The learner is taken through the main features of Photoshop, touching on Colour Correction for Photography, Image design and Composition, Round-tripping, Image Manipulation / Editing / Touching-Up, Airbrushing, “make-overs” and much more. creating incredible, stylish and simply beautiful publications. Project work: Using what has been learned in the four days, we will work on a practical exercise creating a logo and brand pack in Illustrator; editing, colour correcting and compositing photos in Photoshop; creating and pre-flighting a brochure using all the above in InDesign; and finally outputting to print-ready PDF, packaging and archiving.